This is our list of healthy dessert recipes created to blend the best of both worlds, nutrition as well as taste indulgence. Maintaining a healthy body weight and active lifestyle is paramount to living a disease-free existence and happy self-fulfilling life. Simply put, eating lots of baked, processed and refined sweet snacks on a regular basis is most likely not going to help most people achieve and sustain this goal over time. Many of the traditional dessert recipe favorites, however, can be transformed into more appropriate versions for today's new and improved lifestyle choices. It is possible for you to "have your cake and eat it too" and our healthy desserts are intended to satisfy a sweet tooth, yet also deliver an easily digested energy packed fuel source to help you move through your day unhindered by fatigue, stomach upset and constipation. So, if you're ready to say goodbye to using grain flours, white sugar, butter and eggs, at least for these recipes, you have come to the right place. 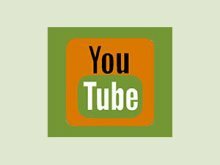 Most any cake, pie, confection or cookie can be made raw vegan style using simple whole food replacements for these customarily used ingredients. 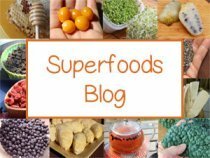 The recipes below are a few examples of what is possible using nuts, seeds, seaweeds and raw plant fats. In addition, these desserts are not only "gluten-free", but also prepared with a blend of natural sweeteners, providing the sweet taste most people enjoy with more stabilizing effects on blood sugar levels along with fewer calories. There is a tendency to abuse too much of a good thing, so it is nice to find a healthy balance between simple pleasure and excess, no matter how healthy a dessert can be. Many of us respond to daily stress with emotional eating and coincidentally the word "desserts" is "stressed" spelled backwards. The sweet taste is reminiscent of the sweetness of our first food, mother's milk, and a completely natural inclination. While juicy ripe fruits would be our first choice when reaching to quench this desire, there is no need to starve yourself of the bit of pleasure that a nice homemade raw lemon bar or slice of cheesecake can bring to a moment in your life. 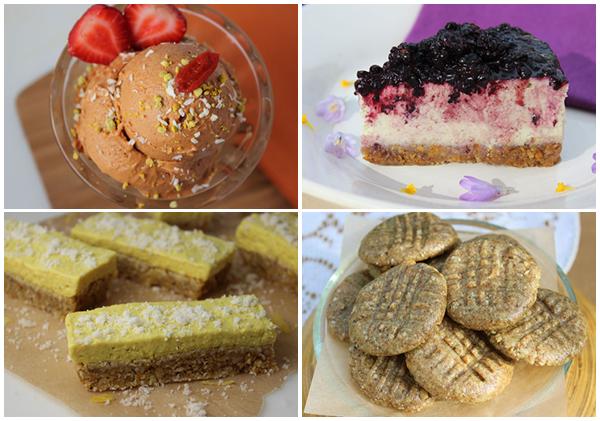 There are a few ways to make raw desserts. One, is to create very basic recipes using mostly fruits, nuts and spices with no other added ingredients. These are easy and simple to make, requiring basic blending or food processing, but sometimes lack the taste and texture of popular desserts we may be accustomed to eating. 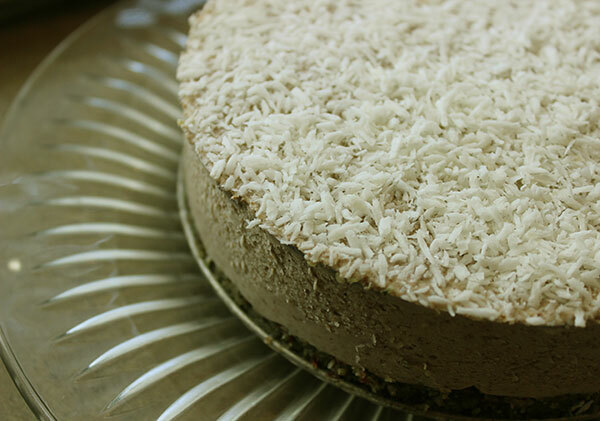 The other way to make raw vegan desserts, closer to the original version, is to utilize various superfood items like irish moss, chia seeds and coconut oil for creating accurate cake-like qualities or thick smooth consistencies. These desserts are sometimes slightly more involved utilizing different herbs, tea concentrates and many different top superfoods. In addition, dehydrators come in handy for developing a baked-like texture. Other necessary kitchen appliances also include a high speed blender, a good food processor and other standard dessert-making items, like cookie cutters, molds, rolling pins and spring-form pans. 1) Irish moss - This is a type of seaweed often used in gourmet raw vegan desserts to add creaminess and create a thick gelatinous texture. Usually, irish moss is purchased as a whole fresh seaweed, which is soaked and blended into a gel that solidifies when chilled. 2) Chia Seeds - Both chia seed and flax seed when blended with water can be used as an egg substitute, producing a similar consistency to egg whites. The ground powders also provide a crust-like texture to pies and cake or when soaked and blended into a recipe produce a thick quality. 3) Nuts and Seeds - All varieties of raw nuts and seeds can be used as flour substitutes by grinding them fresh or can be used as a nut butter. 4) Coconut Oil - This is a great fat to use for adding density to your recipe, especially when chilled as a pie, filling or in raw chocolate. 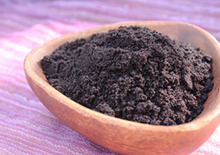 Cacao butter is also used for a similar purpose, which we use in many of our cacao recipes. 5) Natural Sweetener - We like to keep most of our recipes somewhat low on the glycemic index. To do this we often use a combination of zero to low glycemic sweeteners like stevia, lakanto, monk fruit extract or yacon syrup along with higher glycemic sugars like raw honey, coconut sugar and sometimes clear agave. 6) Herbal Teas - We are big on adding in cooled concentrated herbal tea blends whenever a recipe calls for water or a liquid ingredient. 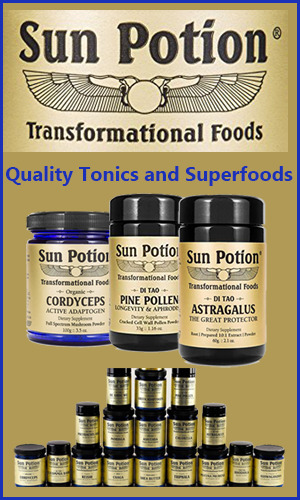 They are a great way to add in additional phytonutrients and medicinal properties. 7) Nut Milks - These are non-dairy milks made with nuts and sometimes seeds, like hemp seed. Nut milks make a great non-dairy substitute for cow's milk with just as much creaminess. 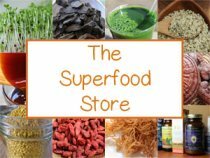 8) Top Superfoods - This component definitely provides an upgrade to any dessert recipe, making use of many of the top superfoods we recommend on this website such as bee pollen, maca, mucuna, pine pollen, medicinal mushroom extracts and most any powdered superfood can be added for an extra potent dessert powered with supplemental nutrients. We recommend eating these desserts, not for "dessert", but on occasion as a meal. Desserts, in general, are better for digestion when eaten alone, not directly after a main entree. It is best to consume a slice of raw cake, for example, several hours before lunch or dinner. 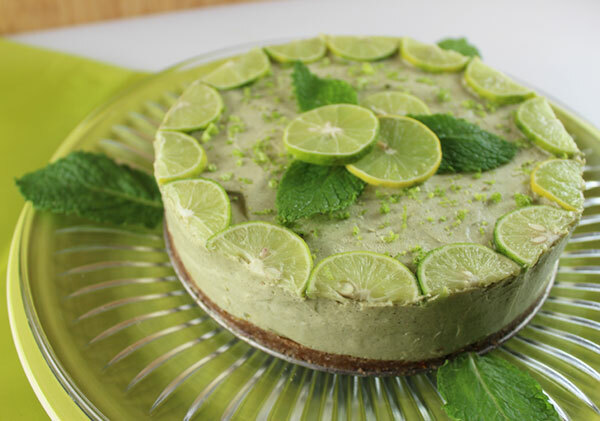 Our key lime pie recipe is the alternative to the traditional version made with condensed milk, egg yolks and sugar. This is a no-bake superfood variety, using nut milk, coconut oil, irish moss gel and natural sweeteners, plus some of our favorite ingredients like hemp seeds, moringa and tiger nut flour. We use authentic key limes for their unique flavor and tart quality, although you can use the standard lime fruit. This halva recipe is our unheated version of the Middle Eastern dessert confection called halva, also spelled halvah. Typically made by blending a hot sugary syrup with sesame tahini or flour-based ingredients, halva is a rich, sweet and calorie abundant treat that you don't need much of to satisfy a sweet tooth. 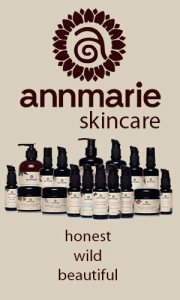 Our recipe is the raw unheated version, created to preserve enzymes and nutritional quality, blending in some highly concentrated top superfoods. This lemon bar recipe is a zesty lemony sweet treat as well as an energy dense fuel source. It is almost 100% raw, minus a bit of lakanto sugar, and completely vegan. 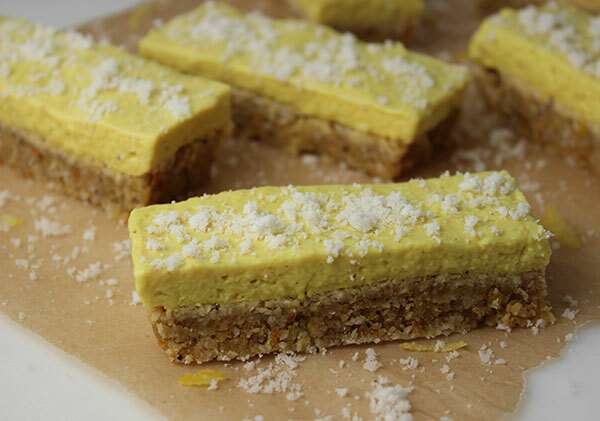 A step or two up from the traditional lemon bar, we substitute some of the usual standards, like butter, flour and white sugar, with coconut oil, nut meal and a blend of natural sweeteners. 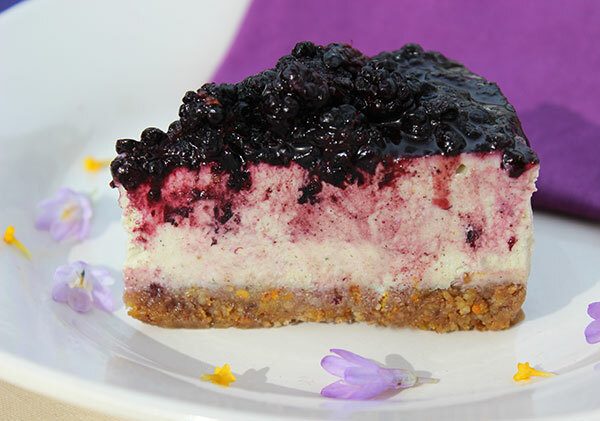 This cheesecake is just the thing when you get the urge for a sweet dessert and is just as cheesy tasting as any standard cheesecake recipe but is completely raw and vegan, made without baking or the use of dairy products, like cream cheese or eggs. In this cheesecake we blend together soaked whole raw nuts and seeds, natural sugars, coconut oil and irish moss gel, and then chill it for the perfect cheesecake-like consistency. 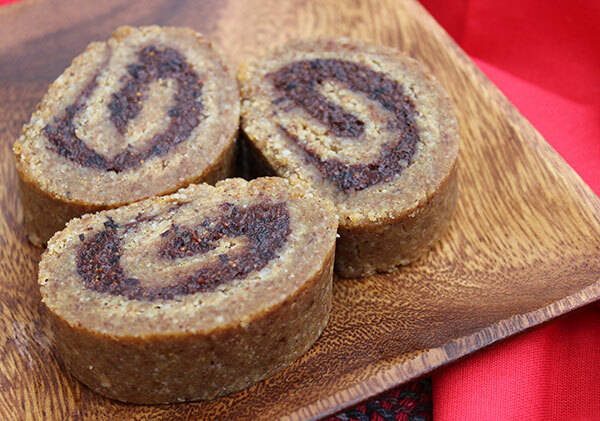 This recipe makes a delicious tasting cinnamon roll, utilizing raw nut and seed flours along with Ceylon cinnamon spiced puréed figs and raisins. We love this recipe because you can roll up a batch or two and store them in your freezer for a premade dessert or breakfast treat. They are easy to slice when frozen and can then be dehydrated for a warmed "baked-like" texture. 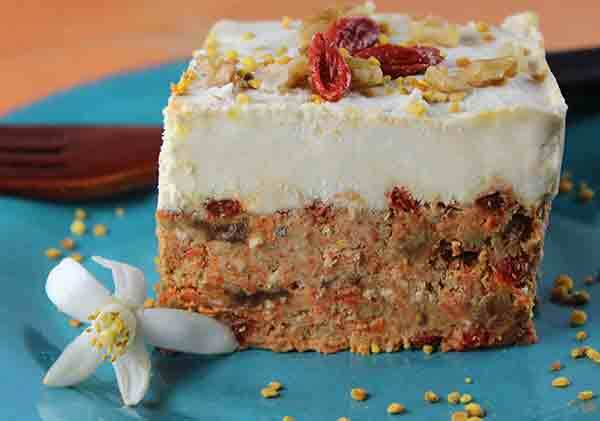 This is an easy no-bake carrot cake recipe made with raw processed carrots, dates, walnuts and coconut as well as a few top superfoods, like the energizing cordyceps mushroom, nutrient-rich bee pollen and, of course, we use goji berries instead of raisins. Topped with cashew cream cheese frosting, this is a power packed cake, perfect as a healthy dessert recipe or as a post workout meal. 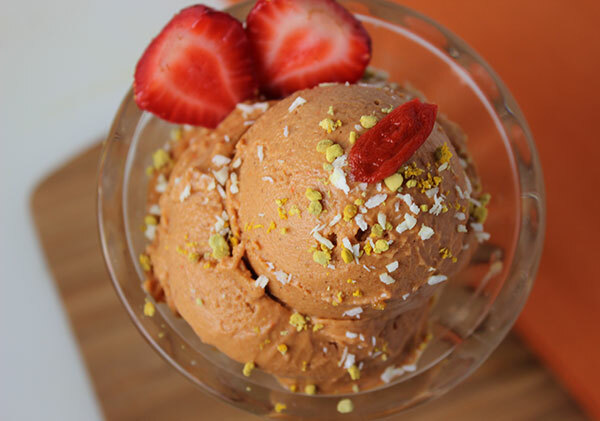 This is our strawberry superfood icecream recipe made with a base of energizing herbal tea, along with a blend of many superfood favorites as well as the added creaminess of coconut meat, irish moss and coconut oil. The ingredients are blended up in a high speed blender and placed in an icecream maker the same way you would make any homemade icecream recipe. A great healthy dessert recipe to enjoy on a hot summers day. Our coconut cream pie recipe is our superfood dessert version of the conventional coconut cream pie. Because this is a raw vegan recipe, we skip the cooking process and leave out the eggs, milk, butter and cream. Instead of dairy we use our rich homemade almond milk in addition to young Thai coconut meat. This gives it a cream pie-like consistency and is the perfect combination when used with chia, coconut oil, cacao butter and irish moss. 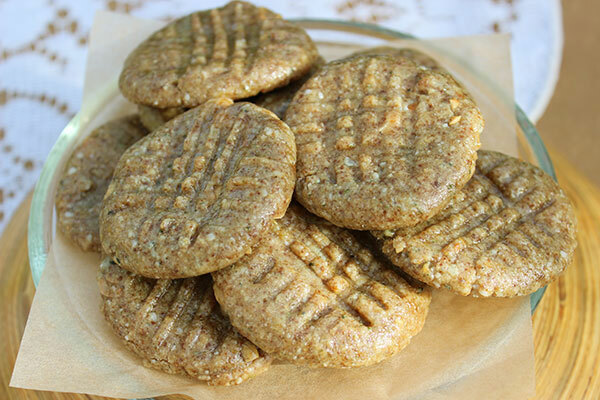 Here is our raw peanut butter cookie recipe, not made using the traditional "peanut butter" ingredient, but utilizing a combination of different superfood nut and seed varieties to give it that familiar peanut butter cookie flavor. These cookies are completely vegan and gluten-free, not made with flour, butter or eggs. They are also not heated, but do employ the use of a dehydrator to provide the best cookie-like texture. In this recipe we use a combination of sacha inchi, hemp seeds, tahini and of course raw wild jungle peanuts, a new Amazonian variety that is now available. 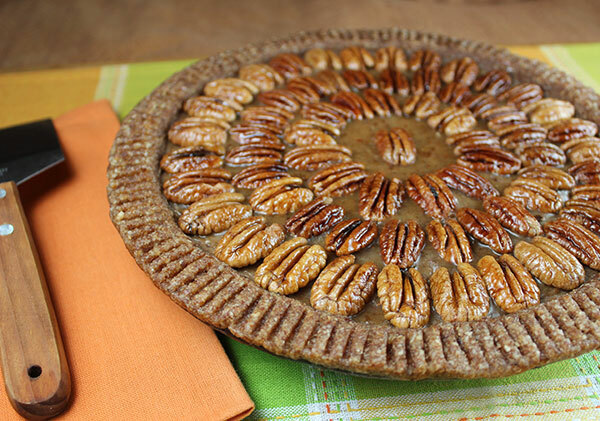 This vegan pecan pie recipe, although scrumptiously sweet, is a little different from the traditional American classic. Our version is made with all raw whole food ingredients as well as a few tonic herbal superfoods, like ginseng and eucommia bark, for an energizing boost. In this homemade pecan pie we attempt to recreate the same kind of buttery creamy texture reminiscent of customary variations. 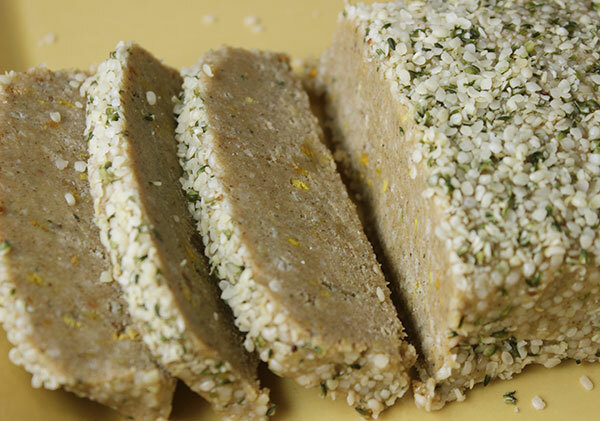 To do this we add in a few raw vegan substitutes like chia seeds, irish moss and coconut oil, all of which allow for the appropriate pie-like quality when chilled and set for a few hours time. Another one of our holiday favorites that is very close to the flavor and texture of the traditional variety, is the gingerbread cookie. 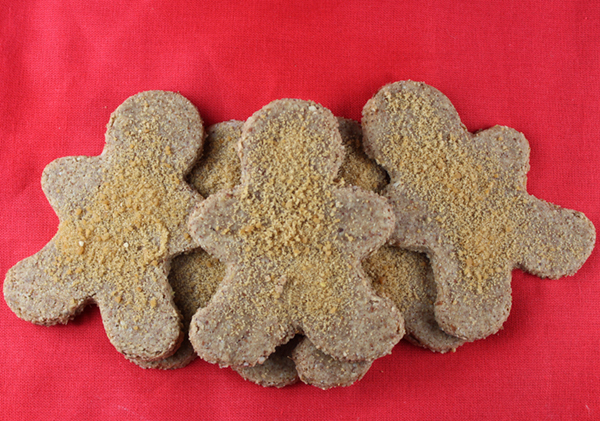 Again, we utilize one of our top kitchen tools, the dehydrator, to create these mouthwateringly-good gluten-free raw vegan gingerbread men. Using coconut oil instead of butter as well as a blend of natural sweeteners, nuts, seeds and of course freshly grated ginger root. 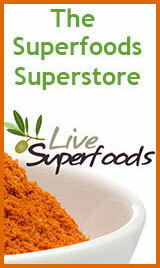 We also include one of our top 10 superfoods, fo-ti or he shou wu, to top things off. 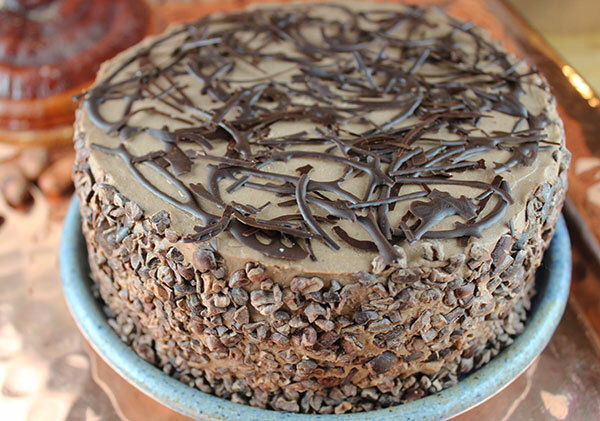 This is a raw chocolate cake recipe we typically make for special occasions and celebratory events. It is especially chocolatey-rich and calorie dense and designed to be consumed in small amounts. 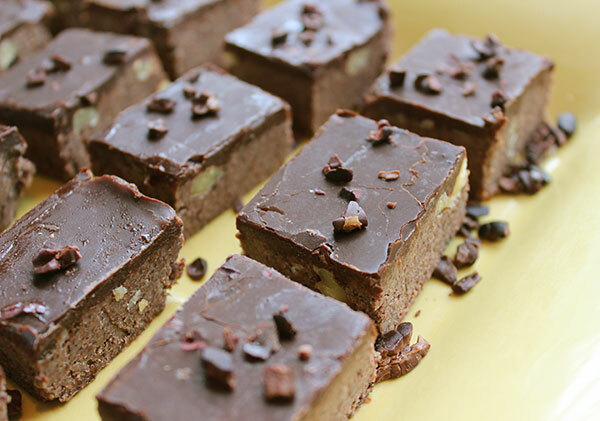 Made with freshly ground whole cacao beans, cacao powder, cacao butter, walnuts and the famous reishi mushroom, this decadent treat is worth the little bit of time and effort needed to create it. Here's a favorite nutritive and alkalizing herbal tea recipe we like drink to balance the sweetness of most any healthy dessert recipe. Enjoy hot or cold, sipped with your favorite raw vegan dessert!